Anthony de la Roché, born sometime in the 17th century, (spelled also Antoine de la Roché, Antonio de la Roché or Antonio de la Roca in some sources) was an English merchant born in London to a French Huguenot father and an English mother. 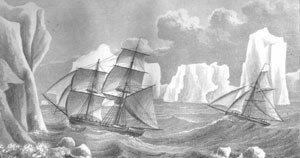 During a commercial voyage between Europe and South America he was blown off course, and visited the Antarctic island of South Georgia, making the first ever discovery of land south of the Antarctic Convergence. Having acquired a 350-ton ship in Hamburg and obtained permission by the Spanish authorities to trade in Spanish America, la Roché called at the Canary Islands in May 1674 and in October that year arrived in the port of Callao in the Viceroyalty of Peru by way of Le Maire Strait and Cape Horn. On his return voyage, sailing from Chiloé Island (Chile) to Bahia de Todos os Santos (Salvador, Brazil), in April 1675 la Roché rounded Cape Horn and was overwhelmed by tempestuous conditions in the tricky waters off Staten Island (Isla de los Estados). His ship failed to make Le Maire Strait as desired, nor round the east extremity of Staten Island (i.e. make the mythical 'Brouwer's Strait' present on the old maps since the 1643 Dutch expedition of Admiral Hendrik Brouwer), and was carried far away to the east instead. Eventually they found refuge in one of South Georgia's southern bays – possibly Drygalski Fjord according to some experts – where the battered ship anchored for a fortnight. According to la Roché's report published in London in 1678 and its surviving 1690 summary, "they found a Bay, in which they anchored close to a Point or Cape which stretches out to the Southeast with 28. 30. and 40. fathoms Sand and Rock". The surrounding glaciated, mountainous terrain was described as "some Snow Mountains near the Coast, with much bad Weather." Once the weather cleared up the ship set sail, and while rounding the southeast extremity of South Georgia they sighted Clerke Rocks further to the southeast. Several days after his departure from South Georgia la Roché came across another uninhabited island, "where they found water, wood and fish", and spent six days "without seeing any human being", thus making what some historians believe was the first landing on the South Atlantic island that had been discovered by the Portuguese navigator Gonçalo Álvares in 1505 or 1506 (and known as Gough Island since 1731). La Roché successfully reached the Brazilian port of Salvador, and eventually arrived in La Rochelle, France on 29 September 1675. Soon after the voyage cartographers started to depict on their maps Roché Island, and Straits de la Roche separating the island from an Unknown Land to the southeast, honouring the discoverer. Captain James Cook was aware of la Roché's discovery, mentioning it in his ship journal upon approaching South Georgia in January 1775. However, Cook made the first recorded landing, and surveyed and mapped Roché Island, renaming it for King George III in the process. J.T. Albernaz, J. de Attayde e F. de Seixas y Lovera. Mapas generales originales y universales des todo el orue con los puertos principales y fortalezas de Ambas Indias y una descripcion topographica de la region Austral Magallonica año de 1692. Published in 1630, appended in 1692. L'Isle, Guillaume de; J. Covens & C. Mortier. (1700/20). L'Amerique Meridionale. Paris. Chatelain, Henry A. (1705/19). Nouvelle Carte de Geographie de la Partie Meridionale de la Amerique. Amsterdam. L'Isle, Guillaume de & Henry A. Chatelain. (1705/19). Carte du Paraguai, du Chili, du Detroit de Magellan. Paris. Lens, Bernard & George Vertue. (ca. 1710). Map of South America. London. Price, Charles. (ca. 1713). South America corrected from the observations communicated to the Royal Society's of London and Paris. London. De Fer, Nicolas. (1720). Partie La Plus Meridionale de L'Amerique, ou se trouve Le Chili, Le Paraguay, et Les Terres Magellaniques avec les Fameux Detroits de Magellan et de le Maire. Paris. Homann Heirs. (1733). Typus Geographicus Chili a Paraguay Freti Magellanici. Nuremberg. Moll, Herman. (1736). A map of Chili, Patagonia, La Plata and ye South Part of Brasil. London. L'Isle, Guillaume de & Giambattista Albrizzi. (1740). Carta Geografica della America Meridionale. Venice. Seale, Richard W. (ca. 1745). A Map of South America. With all the European Settlements & whatever else is remarkable from the latest & best observations. London. Cowley, John. (ca. 1745). A Map of South America. Londra. Gibson, John. (1753). South America. London. Buache, Philippe. (1754). 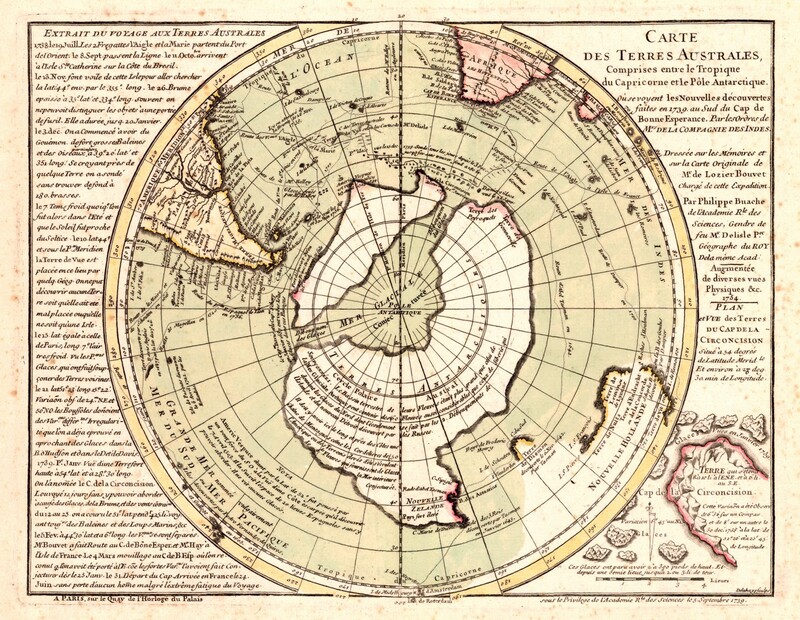 Carte des Terres Australes, Comprises entre le Tropique du Capricorne et le Pôle Antarctique. Paris. Jefferys, Thomas. (1776). South America. Londra. Robert de Vaugondy, Didier. (1777). Vaugondy.html Hemisphère Australe ou Antarctique. Paris. Arrowsmith, Aaron. (1794). Map of the World on a Globular Projection, Exhibiting Particularly the Nautical Researches of Capn. James Cook, F.R.S. with all the Recent Discoveries to the Present Time. London. 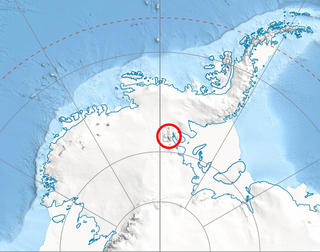 Roché Peak, the highest feature on Bird Island, South Georgia, and Roché Glacier in Vinson Massif, Antarctica are named for Anthony de la Roché. ^ a b J.-F.G. de la Pérouse, F.A.M. de la Rúa. A Voyage Round the World, Performed in the Years 1785, 1786, 1787, and 1788, by the Boussole and Astrolabe: Under the Command of J.-F.G. de la Pérouse, Volume 1. London: Lackington, Allen, and Company, 1807. pp.71-81. ^ Wace, Nigel Morritt. (1969). 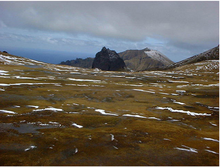 The discovery, exploitation and settlement of the Tristan da Cunha Islands. Proceedings of the Royal Geographical Society of Australasia (South Australian Branch) 10: 11–40. ^ Matthews, L. Harrison. (1931). South Georgia: The British Empire's Sub-Antarctic Outpost. Bristol: John Wright; and London: Simpkin Marshall. ^ Capt. Ferrer Fougá, Hernán. (2003). El hito austral del confín de América. El cabo de Hornos. (Siglos XVI-XVII-XVIII). (Primera parte) Archived 10 August 2011 at the Wayback Machine. Revista de Marina, Valparaíso, N° 6. ^ Faustini, Arnaldo. (1906). Di una carta nautica inedita della Georgia Austral. Revista Geografica Italiana, Firenze, 13(6), 343–51. Giovanni da Verrazzano was an Italian explorer of North America, in the service of King Francis I of France. “ ... our men had each of them three cups of wine in signe of ioy for our good hap ... [and the naming of] the Straights of Le Maire, although by good right it should rather have been called Willem Schouten Straight, after our Masters Name, by whose wise conduction and skill in sayling, the same was found.”. Binot Paulmier, sieur de Gonneville, French navigator of the early 16th century, was widely believed in 17th and 18th century France to have been the true discoverer of the Terra Australis. Weddell Island is one of the Falkland Islands in the South Atlantic, lying off the southwest extremity of West Falkland. It is situated 1,545 km (960 mi) west-northwest of South Georgia Island, 1,165 km (724 mi) north of Livingston Island, 606 km (377 mi) northeast of Cape Horn, 358 km (222 mi) northeast of Isla de los Estados, and 510 km (320 mi) east of the Atlantic entrance to Magellan Strait. The Dieppe maps are a series of world maps produced in Dieppe, France, in the 1540s, 1550s and 1560s. They are large hand-produced maps, commissioned for wealthy and royal patrons, including Henry II of France and Henry VIII of England. The Dieppe school of cartographers included Pierre Desceliers, Johne Rotz, Guillaume Le Testu, Guillaume Brouscon and Nicolas Desliens. Roché Glacier is the 5.8 km long and 2 km wide glacier draining the central part of Vinson Plateau in Sentinel Range, Ellsworth Mountains in Antarctica. Its head is bounded by Mount Vinson to the north, Corbet Peak and Clinch Peak to the east, Wahlstrom Peak to the southeast, and Hollister Peak to the south, with the glacier flowing westwards and descending steeply north of Silverstein Peak to join Branscomb Glacier.